TMSOFT’s Spa Music album will give you the relaxation and peace of mind that comes from a day at the spa from the comforts of your home. The album features seven tracks of calming music inspired by the spa atmosphere. Every song is paired with a natural and soothing ambient background. 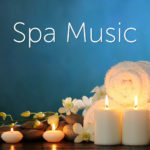 Spa Music is the perfect album to use in the background while you sleep, meditate, practice yoga, study or just simply relax. Listen to the entire album on your favorite digital music platform. Available to stream on all music platforms including Spotify, Apple Music, iTunes, Amazon Music, Google Play Music, Napster, and more! Relaxing Forest Piano – Feel the calm and relaxation of a day in nature. The sounds of birds echo through the forest and piano plays softly with the accompaniment of a lush synth string section. Zen Meditation – Achieve a relaxed state of Zen with the help of soft waves, sea birds, and a rich, atmospheric melody. Zen Meditation is the perfect track to help you meditate, drift to sleep, or take a mental vacation. Ocean Relaxation – Waves crash around you as the music of bell tones and choir like chords flow with the tides. Close your eyes, immerse yourself in the music, and find your own seaside retreat. Cleansing Rain Meditation – Let the soothing sounds and mental images of rain wash away the stresses of the day. Listen as a wooden flute plays lightly over strings to the resounding pitter patter of droplets hitting nearby foliage. Calming Evening Lake – The sun starts to set with a warm orange glow as small waves lap against the rocky shore of a wooded lake. Birds, a clarinet, and a string section play you and the sun to rest for the day. Japanese Summer Garden – The air is the perfect temperature, flowers, ponds, and beautiful rock formations abound. A small creek trickles through a Japanese garden. Music lead by a plucked harp plays to the beauty of the scenery. Meditation Fountain – Crisp water flows out of a beautifully crafted fountain into a clean pool of water. This spot is for you alone to enjoy. Music floats along as fluid and free as the movement of the water, reminding you to let go for just a moment. Also check out our White Noise Streaming Audio available on all digital music stores and our White Noise Web Player for playback in your browser.